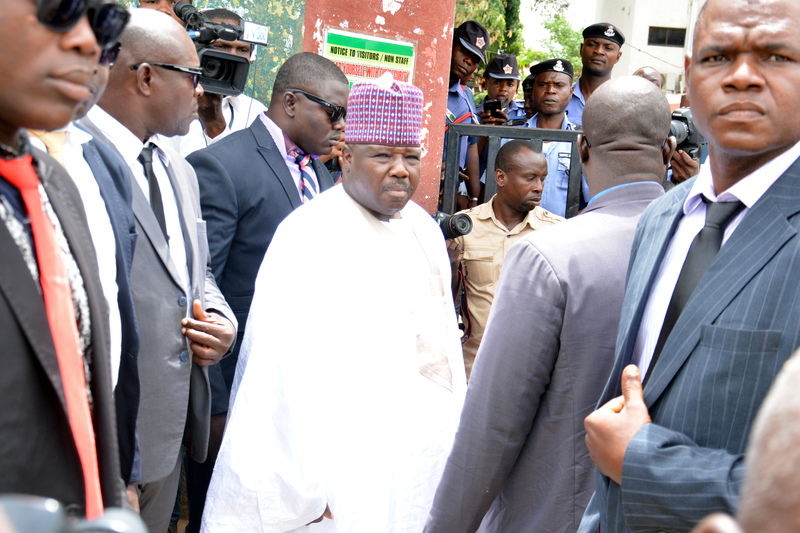 A High Court of the Federal Capital Territory (FCT) yesterday ordered the factional National Chairman of the Peoples Democratic Party (PDP), Senator Ali Modu Sheriff to stop parading himself as chairman of the party. Justice Nwamaka Ogbonna in her judgment placed reliance on an earlier judgment of Justice Valentine Ashi of the FCT High Court delivered on June 26, 2016 which sacked Sheriff and which she said, had not been set aside. Justice Ogbonna held that all actions and decisions taken by Sheriff after the judgment of Justice Ashi on June 26, have become a nullity. Besides, the Force Public Relations Officer, Mr. Don Awunah, a Deputy Commissioner of Police (DCP) said the force was served with the enrollment orders of Justice Okon Abang of the Federal High Court in Abuja stopping the convention. The suit was brought by a contestant to the position of the youth leader, Danladi Ayuba, while the sole defendant is Ali Modu Sheriff. The plaintiff however presented to court the proof of service of all the processes relating to the suit. In the judgment, Justice Ogbonna held; “there is no evidence that the judgement of Ashi J has been appealed against, therefore, the judgement, which is a declarative one must be obeyed. “Anything done contrary to the judgement of Ashi J, delivered on June 26th is null and void and of no effect. The judgement of Ashi J having not been appealed against subsists and is binding,” the judge held. In the suit which was heard two days ago, the plaintiff wants the court to decide among others whether having regard to the binding and subsisting judgement of Justice Valentine Ashi delivered on June 29 in suit No: FCT/HC/CV/1867/2016 which nullified the purpoted amendment of the provisions of Article 47(6) of the constitution of the PDP 2012 by which the defendant is claiming entitlement to the post of the national chairman of the PDP, the defendant can legally continue to parade himself as the National chairman, act or do anything in the name or on behalf of the PDP. The plaintiff however wants the court to declare that the judgement of Justice Valentine Ashi is binding, valid an subsisting. He also wants the court to declare that in pursuance of the said judgement which nullified the amendment of the provision of Article 47(6) of the PDP Constitution by which the defendant is claiming entitlement to the post of the national chairman of the PDP, the defendant cannot legally and lawfully continue to parade himself as the National Chairman of the party. In addition, the plaintiff is also praying the court to declare that the act of the defendant in parading himself as the National Chairman of the PDP is unlawful, illegal, null and void and of no effect whatsoever. Ayuba, in his suit, wants the court to give an order setting aside the act and conduct of the defendant done in the capacity of National Chairman of the party. He also wants the court to give an order that the defendant cannot convene any meeting, conduct any congress or primary for the purposes of nominating the party candidate for any election. Also, the plaintiff wants the court to give an order setting aside all acts conducted by the defendant after the judgement of Justice Valentine Ashi. He also wants the court to grant an order of perpetual injunction restraining the defendant from parading himself as the National Chairman of the party.